Lindisfarne were an English folk-rock group from Newcastle-upon-Tyne, formed in the late 1960s. The original line up was Alan Hull, Ray jackson, Ray Laidlaw, Rod clements, and Simon Cowe. The group released their debut Nicely out of Tune in 1970. Their second album, Fog on the Tyne, was produced by Bob Johnson, who had also worked with Bob Dylan, to whom Alan Hull was being compared at the time. Following their third album, Dingly Dell, the group split and Lindisfarne (Mark II) continued with new members, and produced a few more albums before disbanding, seemingly for good. The group released their debut Nicely out of Tune in 1970. Their second album, Fog on the Tyne, was produced by Bob Johnson, who had also worked with Bob Dylan, to whom Alan Hull was being compared at the time. 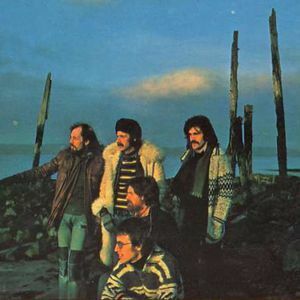 Following their third album, Dingly Dell, the group split and Lindisfarne (Mark II) continued with new members, and produced a few more albums before disbanding, seemingly for good. 1978 saw the original group re-form, with the album Back and Fourth, and the hit single "Run for Home". This line-up continued for many years. New member Marty Craggs came in for the 1986 album Dance Your Life Away. Ray 'Jacka' Jackson eventualy left to work in London, and then Si Cowe left to run a brewery in Canada. Jackson now (2008) has a career as an artist, specialising in colourful paintings of buses, a passion since he was a boy. He also played the mandolin on Rod Stewart's "Maggie May". The group celebrated their twenty-fifth anniversary of performing at Newcastle City Hall in the summer of 1995. Less than six months later Hull died of a heart attack. There was a period of consolidation for the group, which decided to continue - going back to their folk roots, and new members Billy Mitchell, Dave Denholm and Ian Thompson. This line up continued for several years until the departure of Marty Craggs. After this the three remaining members continued to tour as an acoustic trio before calling it a day with a final gig on 17th May 2004. * A Black Metal band from Russia, Volgograd. * A Pagan/Folk Black Metal from Germany, Solingen.